Frances Tiafoe blamed stomach problems for derailing his bid to become the youngest U.S. man in Wimbledon’s fourth round since 1990. ”Body just didn’t feel right,” Tiafoe said. ”Just felt it was completely in my hands,” Tiafoe said. Novak Djokovic didn’t let a bad call on a crucial point get the better of him as he knocked out home favorite Kyle Edmund in Wimbledon’s third round. Djokovic was robbed of a break at 3-3 in the fourth set when the ball bounced twice before Edmund managed to return it over the net at 15-40. Djokovic complained to the chair umpire but the call stood – even though TV replays also showed Edmund’s shot actually landed wide. Edmund was the top British man in the draw in Andy Murray’s absence and beat Djokovic on clay in Madrid this year. But his exit means all 12 British players – four men and eight women – have been knocked out. Gulbis’ ranking has fallen to 138th after struggling for form in the past few years, having reached No. 10 in 2014. But he looked back to his old self in defeating one of tennis’ top young talents, dominating the final set on No. 1 Court. He is the first qualifier to reach the men’s fourth round since Brian Baker in 2012. With Jelena Ostapenko also advancing in the women’s draw, it’s the first time in history Latvia has more than one player in the round of 16 at a Grand Slam. Nadal hasn’t dropped a set so far in the tournament. Against de Minaur, he faced only three break points and saved them all, while producing nearly twice as many winners, 30-17. This is Nadal’s eighth trip to the round of 16 at the All England Club, where he has won two of his 17 Grand Slam titles. A year ago, the Spaniard lost at that stage. Halep’s exit means only one of the women’s top-10 seeds remains in the tournament – No. 7 Karolina Pliskova. Halep served for the match at 5-3 in the final set and had a match point in the next game, but the French Open champion couldn’t capitalize on her chances. Hsieh saved the match point with a backhand winner before holding for 5-5 and broke Halep in the next game. The Romanian had two more break points at 6-5 but couldn’t take advantage. The match featured a total of 14 breaks of serve – seven for each player – including five straight to open the first set. Playing at Wimbledon comes at a price when you’re a new mother. Serena Williams says she missed her daughter Olympia’s first steps while she was practicing at the All England Club on Saturday. Williams became a mother in September and missed last year’s Wimbledon because of her pregnancy. She’s back looking for her eighth title at the tournament and reached the fourth round on Friday. She has brought Olympia with her, and a photo on the baby’s Instagram account last week showed her sitting on one of the grass courts. 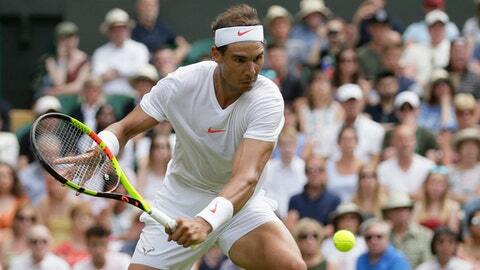 Nadal is looking to win Wimbledon for the third time while Halep is trying to follow up her maiden Grand Slam triumph at the French Open with a first title at the All England Club. She is one of only two top-10 seeds remaining in the women’s draw.